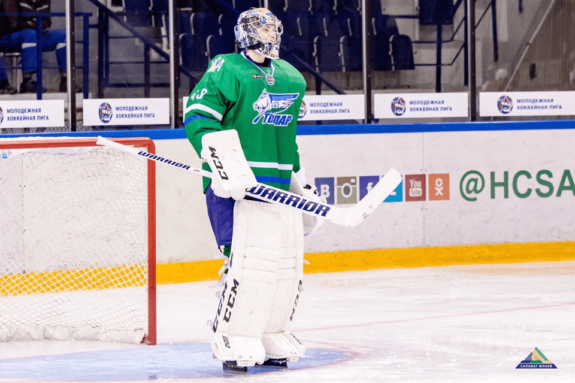 Considered one of the top goaltending prospects in Russian hockey, Daniil Tarasov had an exciting career until he had to miss the whole 16-17 season with a lower-body injury. In spite of that, he was drafted pretty high in the NHL draft as the Columbus Blue Jackets decided to spend the 86th overall pick on him. 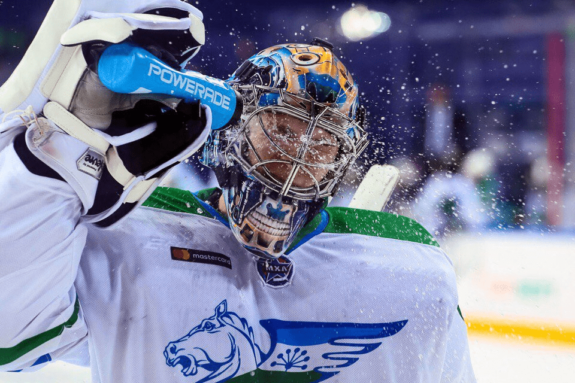 In this translated interview, originally appearing on the Russian website ProUfu.ru, Tarasov talked about his injury, his prospects for the new season, and his desire to move overseas. Rustam Maksyutov: You didn’t play in some games for Tolpar Ufa. What happened? Daniil Tarasov: I’ve picked up a small injury playing against Novokuznetskie Medvedi, nothing terrible. Nothing to worry about. RM: Hearing that you were injured again was scary. You already lost a season. RM: Was it hard to miss an entire season? DT: I wouldn’t say so. I was supported by my family. I regularly went to the arena to meet the guys and the coaches. It wasn’t a bad period, nothing terrible. RM: What was your injury about? DT: I underwent tibia surgery. There was something like a tumor formed. RM: This means that your injury didn’t happen while playing, right? DT: This is what happened: during the preparation for the Ivan Hlinka tournament we started working on ground. And I started feeling some pain. I visited the doctors and started attending physiotherapy, but I got no results. So I had an MRI and all became clear. RM: You probably weren’t thinking that it was so serious. DT: At first I was told that all would have been okay in six months. Then, after the surgery, they said three months. Then again three months and at that time I understood that I’d have to sit for the whole season. DT: It was hard at first. I watched the games and was sorry not to be able to help my team. Then, going on, I could start practicing at least at the gym. But I saw the ice only ten months after the surgery. RM: And all of this happened just before the NHL Draft. DT: I think that I wouldn’t have been picked at all if we weren’t sent to the U18 WJC. After all that stuff, teams from overseas started being interested in me. Scouts started asking how I felt, how the recovery was going. We also sent them videos of my practices so that they would be sure about my health. You know, it’s not like [NHL teams] are willing to waste draft picks. That’s why they try to learn anything they can. RM: When did you understand that you’ll get drafted? DT: About one month before the draft, everything was clear. Detroit should have picked me with the 88th pick, but the Jackets anticipated them. RM: Are you disappointed by the result? DT: Of course I am not. Columbus have a good team, and there are Russian players there. RM: They have Sergei Bobrovsky. Did you meet him? DT: Not yet. I didn’t attend the summer camp there. I was in Ufa, they already got the team together and told me that I could attend the camp only next year. Of course I want to go there and watch everything with my eyes. It will be interesting to have a look at how things work there and be part of that. RM: Are you in touch with the Blue Jackets staff? DT: Now we aren’t talking much of course. But when I was in Finland with Salavat Yulaev’s senior team, they came to see me. I told them that I still have two years of contract in the KHL and I will honor my deal. Then we’ll see. RM: How often you get compared to Andrei Vasilevskiy? DT: Oh, not at all. If you’re going to copy someone, then the copy will always be worse than the original. That’s why I always try to show what I am worth myself. RM: But in any case you wouldn’t be sorry to have such a career, right? DT: Of course. I think that any goalie would just dream about such a path. RM: Who are your favorite goalies? DT: If we talk about our Russian goalies, then I’ll pick Vasilevskiy and Sergei Bobrovsky. If we take into account foreigner goalies too, I like Carey Price. RM: You became a goalie because you wanted to follow the steps of your father, [former Montreal Canadiens draft pick Vadim Tarasov]? DT: Not at all. I started playing when I was three and I was ready to go to the net. But my father was a bit against it, he wanted me first to learn skating well, so I played as a defenseman until I was seven. I started playing goalie already when we moved to Ufa [from Novokuznetsk]. I always wanted to be a goalie. RM: Because of your father? DT: I don’t know. I always liked goalies. But maybe the fact that my dad was a goalie had some impact. RM: How does your father take part in your career? DT: We’re in constant dialogue. On ice our ties are like coach – player [Note: Vadim Tarasov is Salavat Yulaev’s goaltending coach], but at home we are father and son. We talk a lot about hockey, try to correct my mistakes or to find some nuances. RM: Does he scold you when you have a mistake? DT: He gives me time to understand what happens after the games. We don’t have a look at mistakes right after I do them. We get to the videos only the next day, so that we can analyze it with a cool head. RM: Where is it simpler for goalies: on North American or European ice? DT: I like the North American one. More shots, a higher pace, you’re always under pressure. On European ice it’s different. Sometimes the play is only at one end, and you need to stay focused as there are no shots at your crease. So maybe you only get two shots, and you have to save them both to help your team. In North America there are more shots and you get them from all over the ice. RM: It seems that you really want to go play in North America. DT: Of course. But I think that you shouldn’t go there just to try, but with a concrete goal of playing in the NHL. Many guys go there just to try and then get back. And those who have a goal, usually, stay there and play. 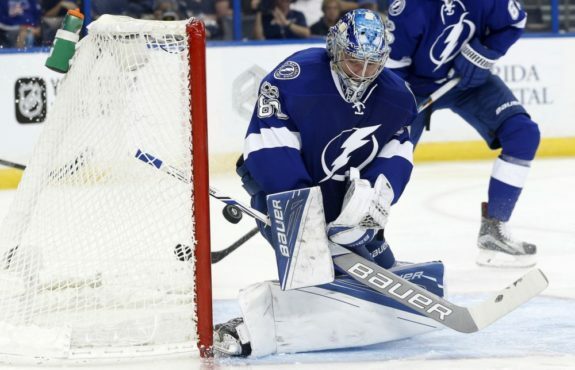 For example, Vasilevsky. He didn’t start playing right away, but he had a goal. His desire and motivation brought him where he is now. Someone has such a stereotype, that if you go there, then you’ll get drafted. But it’s completely different. There are no practices like in Russia, everything happens playing games. NHL scouts work in all over the world. They get even to Ufa to watch players. Of course, if you play for the national team, then you’ll have more chances to get noted. RM: Isn’t it hard to move from the European to the North American ice surface? RM: It looks like you’re a fan of a more dynamic play.